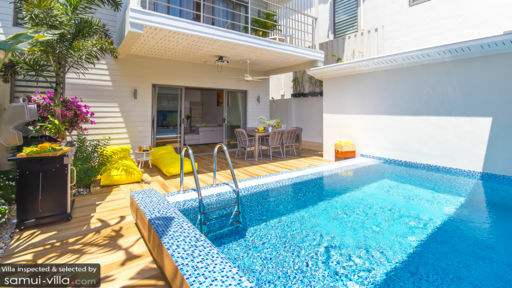 Villa Limoncello, as the name suggests, is a refreshing, vibrant, and bright holiday home in Samui and it is part of the Ban Tai Estate on Bantai beach. 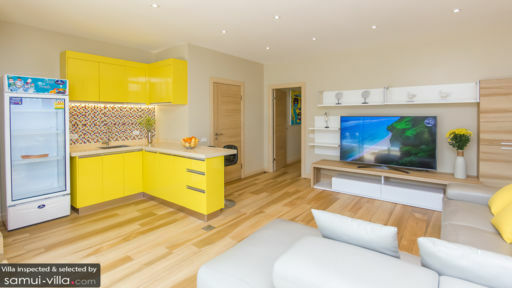 The three-bedroom home features unique shades of lemon yellow and neon green that complement the natural greens and blues as seen outdoors. Wooden pool deck, outdoor cinema, and a separate kitchen pavilion beside the pool are some of the unique qualities of Villa Limoncello. Walking distance from the beautiful beach, this serene and quiet place is an idyllic home for guests for rest and relaxation away from the chaos of city lives. Of the three bedrooms at Villa Limoncello, one is located downstairs while the remaining two are found upstairs attached to a terrace overlooking the pool. The bedrooms feature similar design owing to king-sized beds, vividly-coloured and cushioned headboards, and wooden flooring. The air-conditioned bedrooms offer comfort, familiarity, and a homely ambiance where you can relax without a care in the world. Equipped with satellite TVs, the bedrooms also deliver on entertainment. Guests can even request for a baby cot. Ensuite bathrooms accompany each bedroom and they are modern with necessary amenities. As you enter through the wooden doors, you are greeted by a resplendent and luscious sight with beautiful tropical plants lining the villa walls, a small lounge area few on a raised platform with green beanbags, a pristine pool deck with sun chairs for sunbathing and napping, and an alfresco dining area for six. 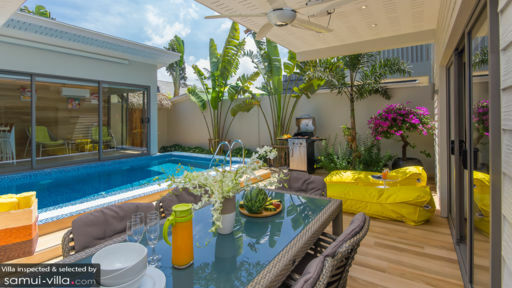 Enjoy a hearty breakfast right beside the swimming pool amid the fresh, tropical breeze. Kids and adults alike will find this part of the villa to be utterly charming what with a roll-down projector screen to transform this space into a cosy outdoor cinema that you have all to yourselves. The living area at Villa Limoncello is a modern affair with clean, elegant design featuring wooden floors, an entertainment console with a flat-screen TV and DVD player, and a beige modular sofa with faux leather upholstery. The taupe walls are decorated with bright artwork while bright yellow hues can be seen on the cushions and the cabinets belonging to the kitchenette. A refrigerator can store all your beverages to keep them cool and the living area is air-conditioned to keep the tropical heat at bay. The dining area outside on the terrace is the perfect spot for a feast with loved ones and you can even enjoy the privacy of the compound. The most characteristic feature of Villa Limoncello has to be its separate kitchen and lounge area. Located right across from the main living pavilion separated by the pool, this is the main kitchen at the villa that is fully-equipped with a breakfast bar, modern appliances, and useful amenities. There are even comfortable lounge chairs and bar chairs for additional seating. This space is like your own, little café. Personal guest assistance and maintenance of the property ensure you have the most wonderful stay at the villa. The staff is there to look after you and provide services such as housekeeping, security, pool/garden maintenance, and etc. You may indulge in an in-house massages, or rent a chauffeured-car, bike, or scooter as per your need as these are charged extra. A private chef can be appointed to do the cooking for you and prepare scrumptious local and international dishes. Found on Bantai beach, the villa offers magical views close-by as well as a glorious sunset whenever you fancy. There is an ancient temple a little way from the villa, Wat Na Phra Lan, and you can find plenty of restaurants and cafes in the vicinity.